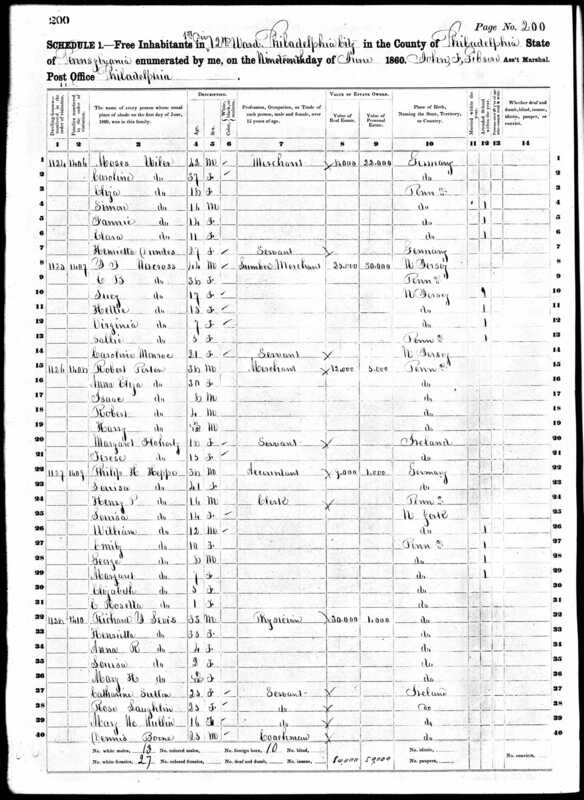 My last post covered the migration of several Nusbaum/Dreyfuss family members to Peoria, Illinois in the 1860s. 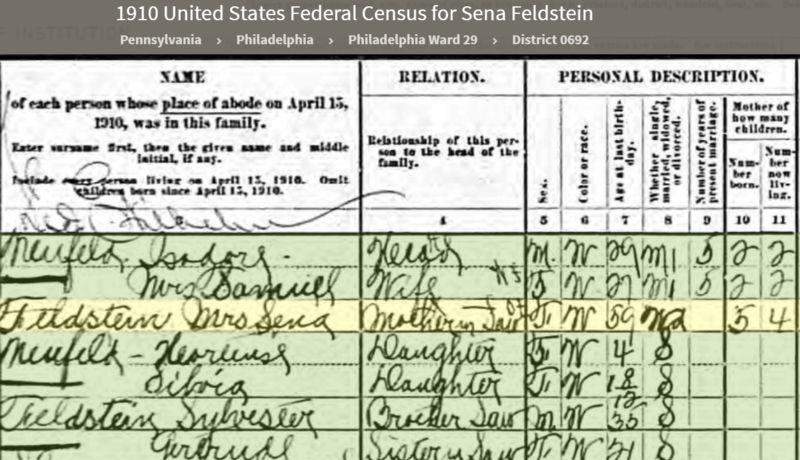 Meanwhile, back in Pennsylvania, the rest of the Nusbaum/Dreyfuss clan was growing during the 1860s. In Philadelphia, two of the Nusbaum brothers and two of the Dreyfuss sisters were seeing their families grow and their children grow. Other family members were still in Harrisburg. By the end of the decade, even more of the family would have relocated to Philadelphia. The Civil War was having at least some minor financial impact on the family. For example, John Nusbaum was liable for $26.79 in income tax to the federal government in 1862 under the terms of the Internal Revenue Act of 1862. That law was enacted to raise money to help pay for the expenses incurred by the Union in fighting the Civil War. It was the first progressive income tax imposed by the federal government. For anyone whose income exceeded $600 a year, a tax was imposed based on the level of income. 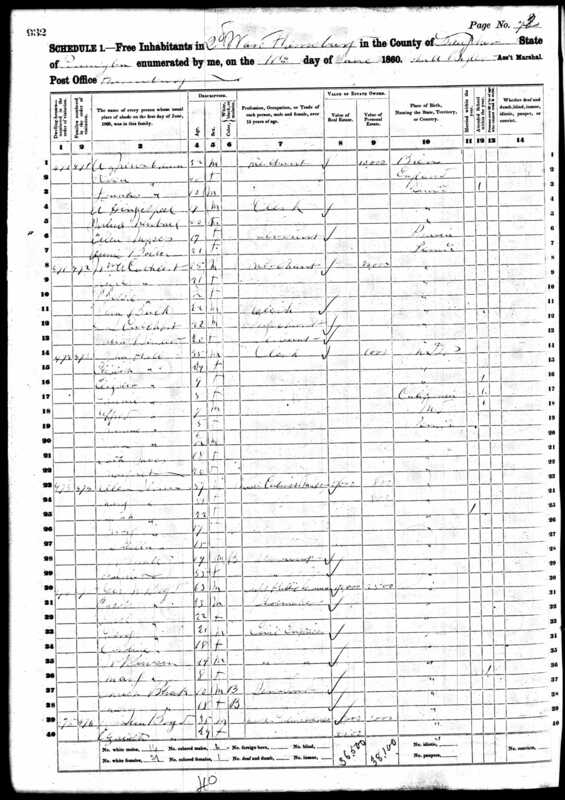 For John Nusbaum, whose income was valued at $892.96 in 1862, that meant a tax of $26.79. 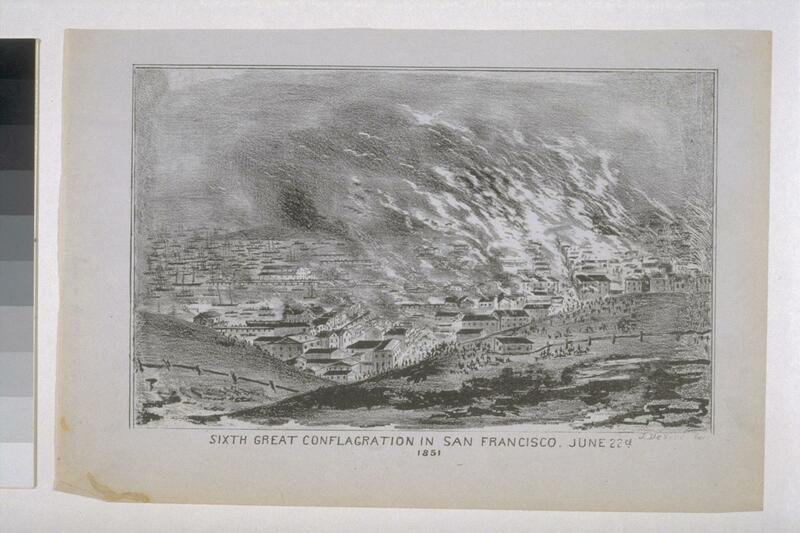 According to one inflation calculator, $892.96 in 1862 would be worth about $20,000 in 2014. For someone with stores in Philadelphia and Peoria (and possibly still some interest in a store in Harrisburg) and who reported $6000 in real estate and $20,000 in personal property in 1860, that does not seem like a lot of income, but I have no idea how that was determined back then. 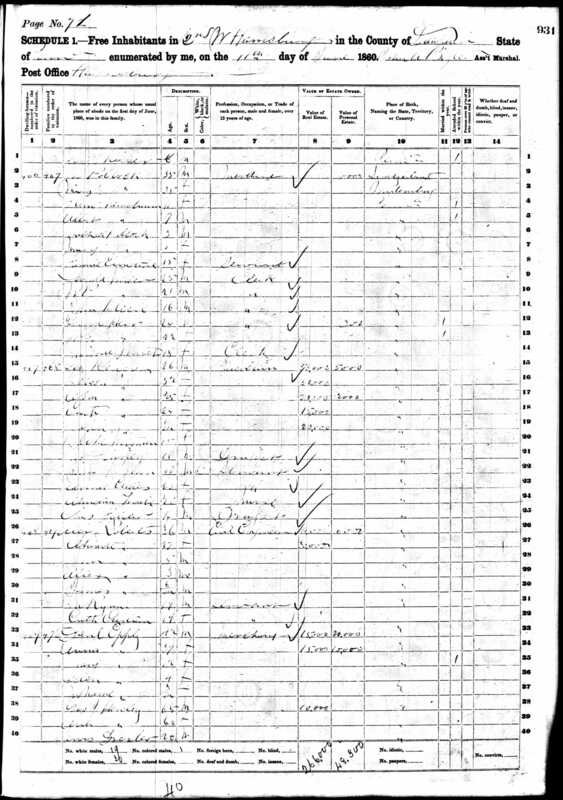 By 1863 John and Jeanette (Dreyfuss) Nusbaum, my three-times great-grandparents, had seen their two older sons move to Peoria, but they still had one son, Julius, and two daughters at home in 1863: Frances, my great-great-grandmother, who was eighteen, and Miriam, who was only five years old in 1863. Plus 1863 had started off with another new baby in the family. 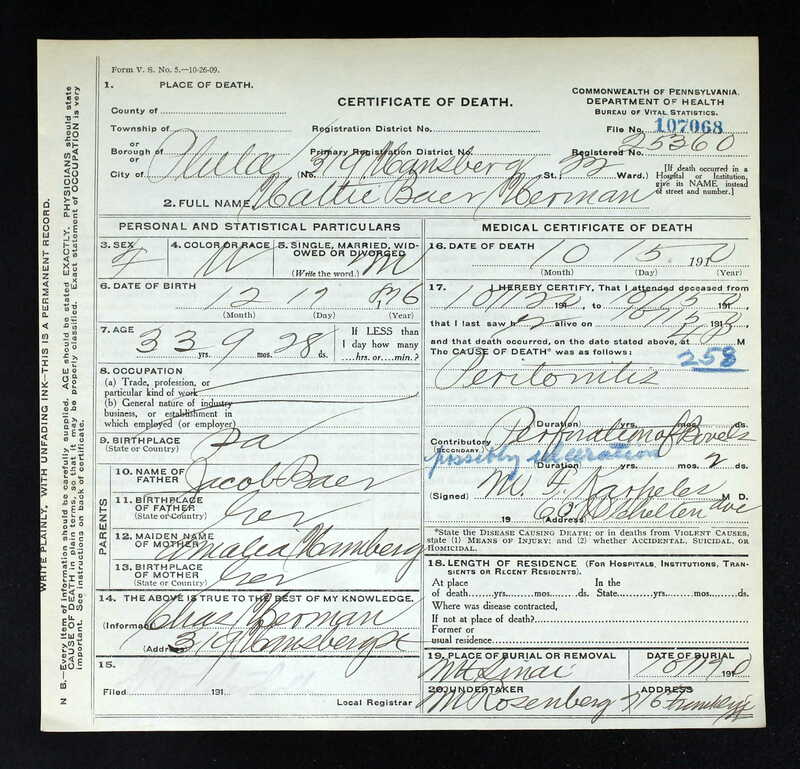 Lottie Nusbaum was born on January 1, 1863. 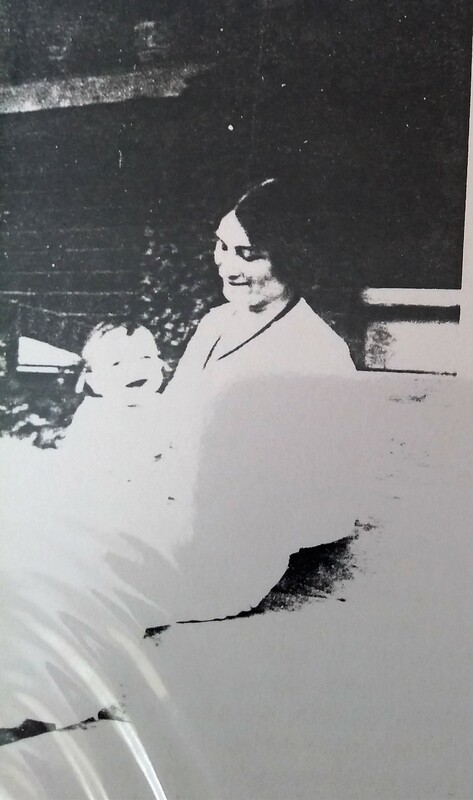 Jeanette would have been almost 46 years old, and her first born child Adolphus was going on 23. 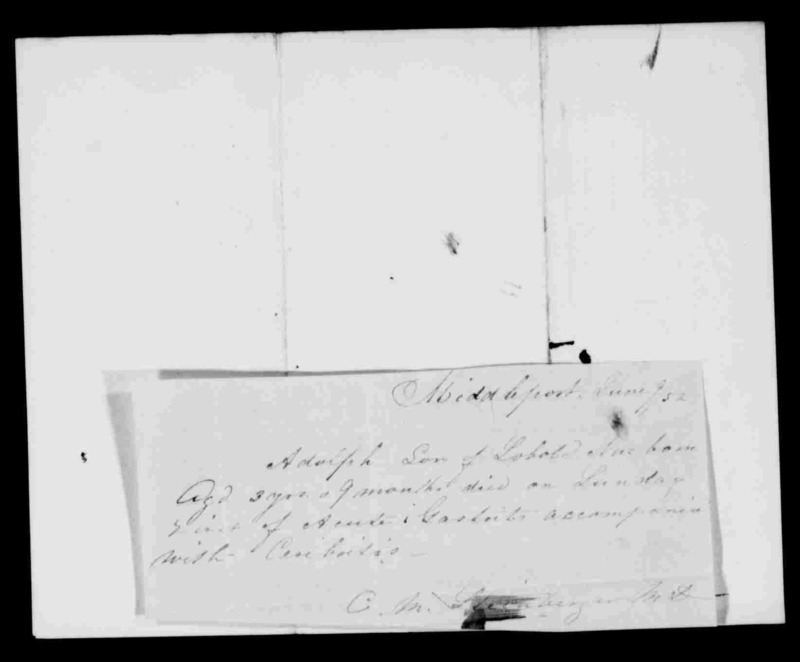 I have to admit that I have some questions about whether Lottie was actually the child of John and Jeanette. Jeanette must have been close to the end of her child-bearing years. They had not had a child in five years. Could Lottie have been a child of one of their sons, raised as the child of her actual grandparents? Or a child they adopted? I have no way of knowing. Lottie had no children, so even if I could figure out some way to use DNA to answer my doubts, there are no descendants to use for DNA testing. 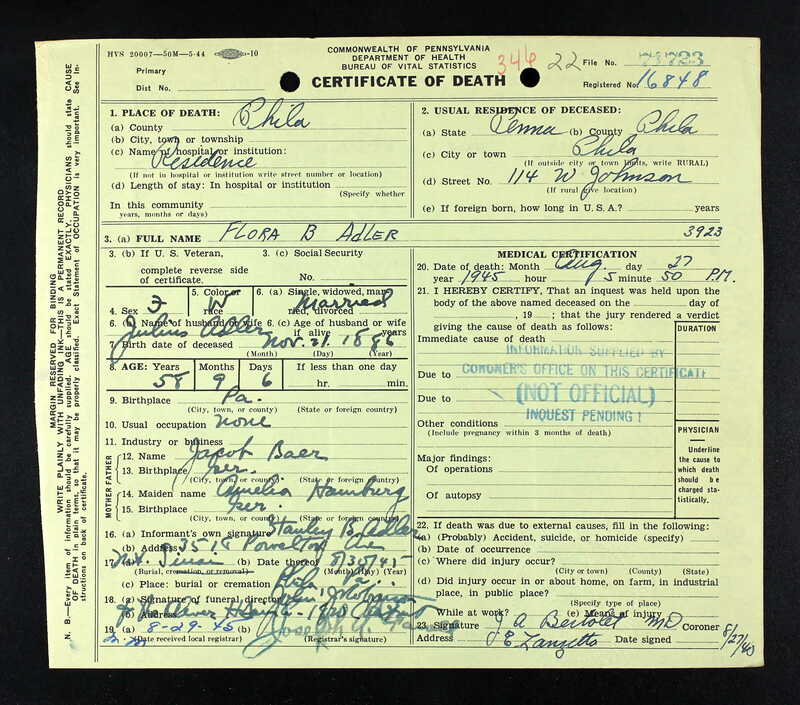 On Lottie’s death certificate, the informant was Mrs. E. Cohen, that is, my great-grandmother Eva Seligman Cohen, Lottie Nusbaum’s niece and Frances Nusbaum Seligman’s daughter. 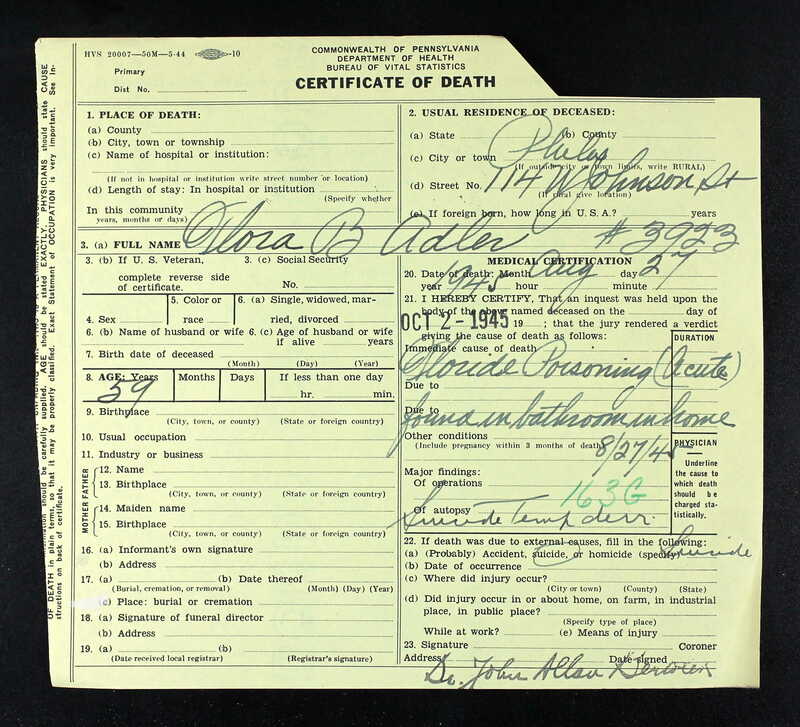 Eva filled in the father’s name as John, but put unknown for the mother’s maiden name. Eva certainly knew her grandmother Jeanette’s name. (Eva is the one who held and maintained the family bible for many years.) 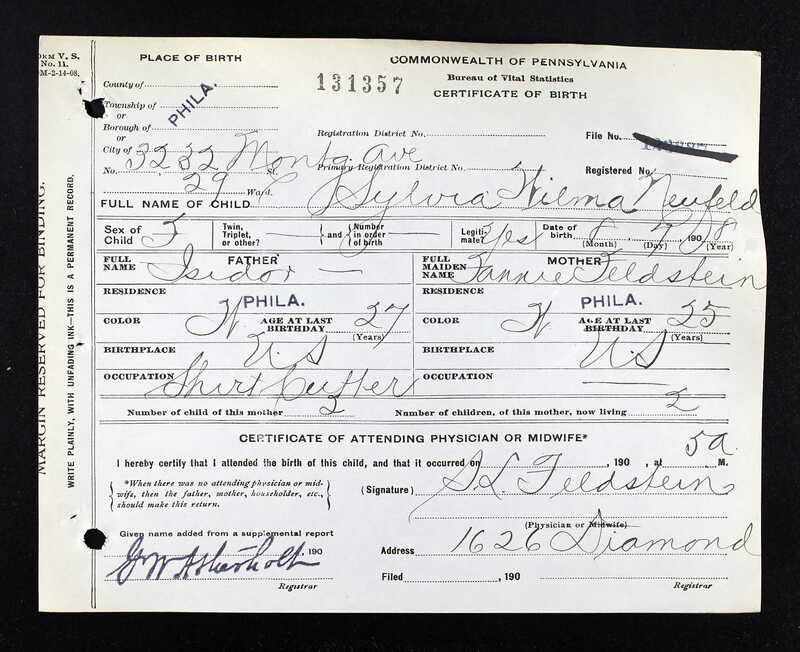 Did she not know her grandmother’s maiden name? Was she too grief-stricken to remember? Or was she suggesting that Jeanette was not in fact Lottie’s real mother? I do not know, and there is no one left to ask. But it did not do anything to resolve my doubts about the identity of Lottie’s parents. Maybe I am too skeptical. Maybe she was just a menopause baby. Maybe John and Jeanette were missing their boys so much that they decided to have one more child. Or maybe not. What do you all think? In any event, just as John and Jeanette were emptying their household of their sons, they had a new baby to raise. The family was still living at 433 Vine Street in 1862, according to the Philadelphia city directory, but in 1864 they are listed at 455 York Avenue. 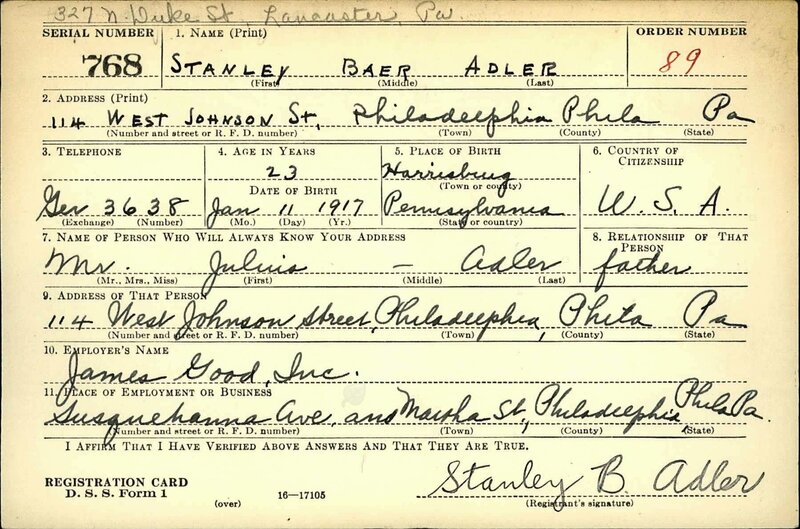 That address is about two and a half miles north of Vine Street, and as I’ve discussed earlier, Jews began to move north in Philadelphia as their socioeconomic status improved. By 1865, John and Jeanette’s house on York Avenue was a little emptier. 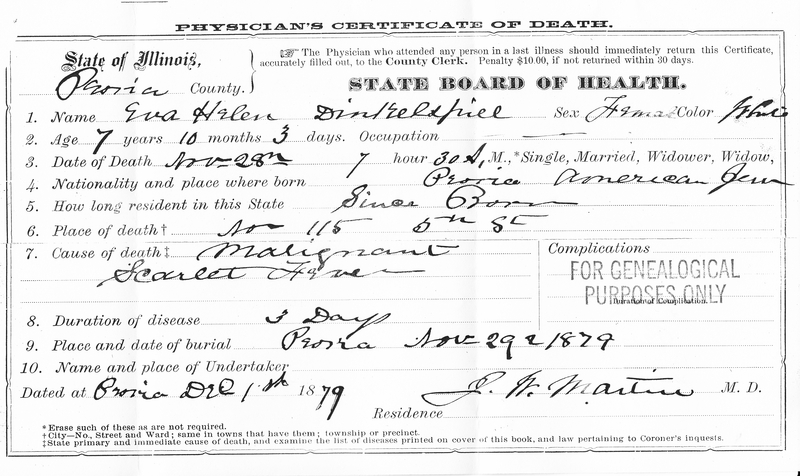 By that time Julius had joined his brothers in Peoria, and on March 28, 1865, my great-great-grandmother Frances married Bernard Seligman. 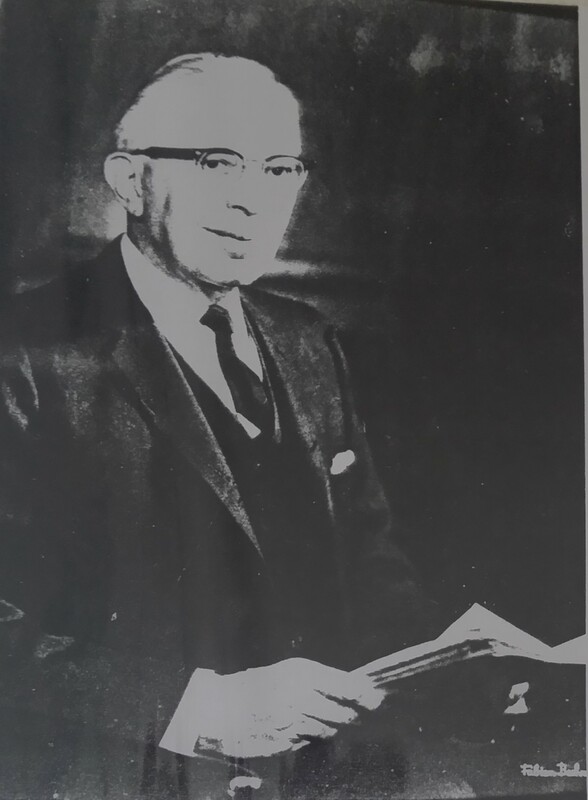 For several years they lived in Philadelphia, and Bernard was apparently in business with his brothers-in-law in a firm called Nusbaum Brothers and Company. 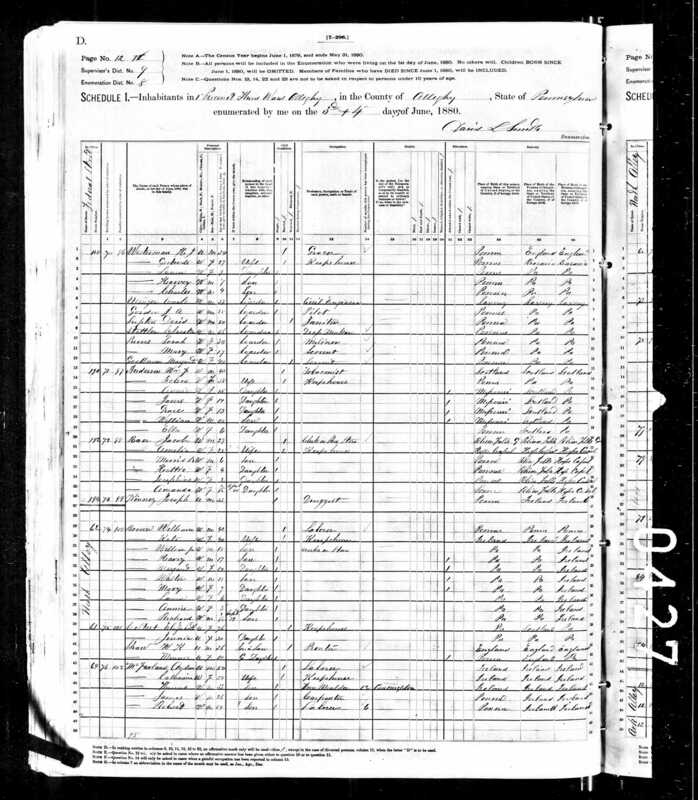 They had four children between 1866 and 1869, including my great-grandmother Eva. Then in 1870, Bernard returned full time to Santa Fe with Frances and their children where Frances and Bernard lived for almost all of the rest of their lives, as discussed in my Seligman blog posts. 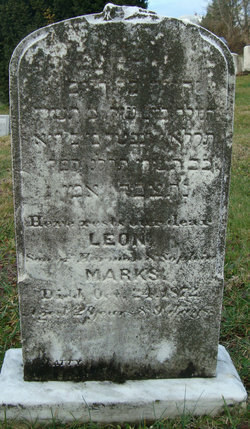 John’s brother Ernst was also in Philadelphia during the early 1860s. 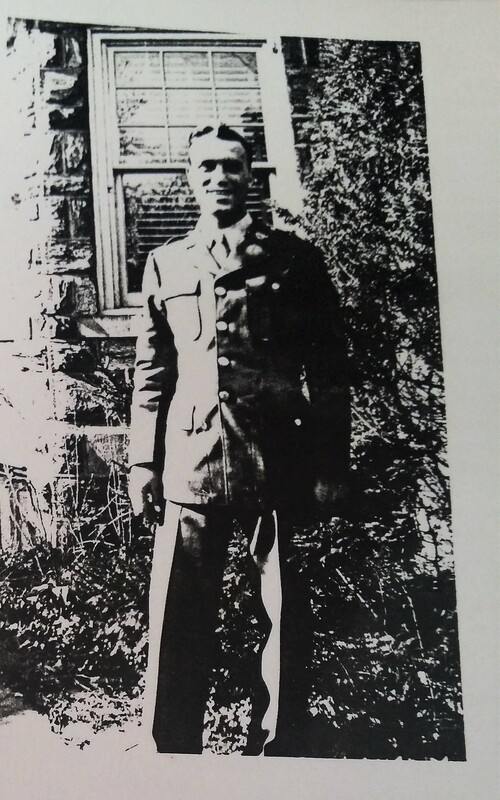 He was a clothier, working at 55 North Third Street and living at 626 North 6th Street. 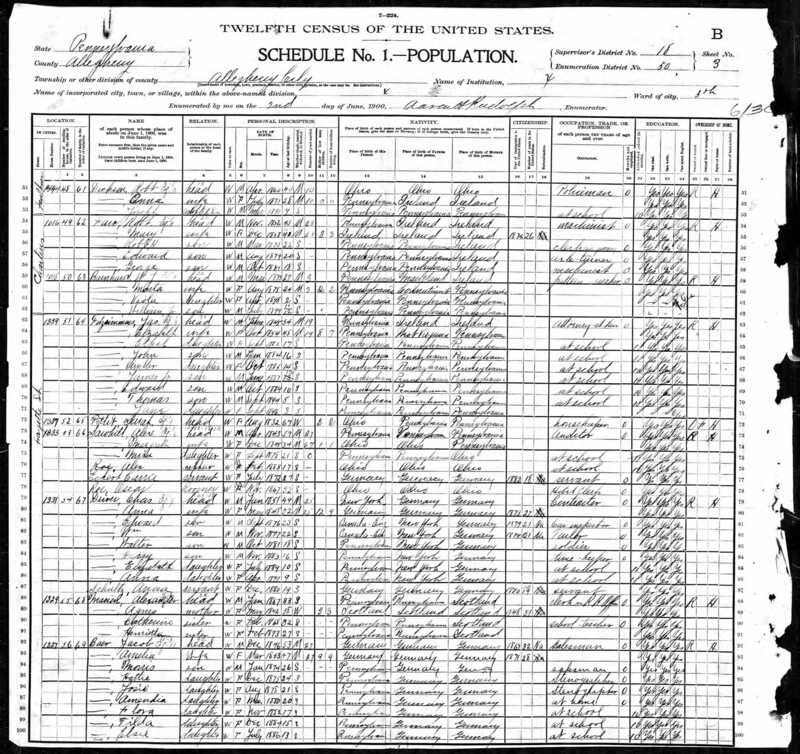 He and his wife Clarissa had another child in 1861, Frank, bringing their family up to six children ranging in age from newborn to ten years old. So both Ernest, who was 45 when Frank was born, and John, who was 49 when Lottie was born, had new babies in their homes in the 1860s. Jeanette (Dreyfuss) Nusbaum also had a sibling living in Philadelphia. 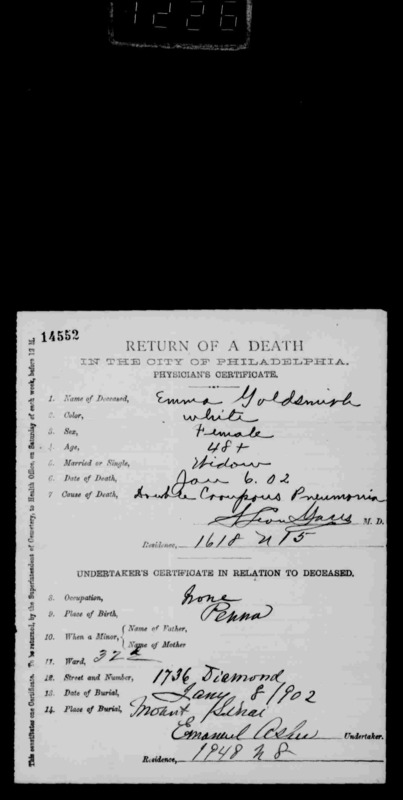 Her sister Caroline (Dreyfuss) Wiler had also moved from Harrisburg to Philadelphia by 1860. 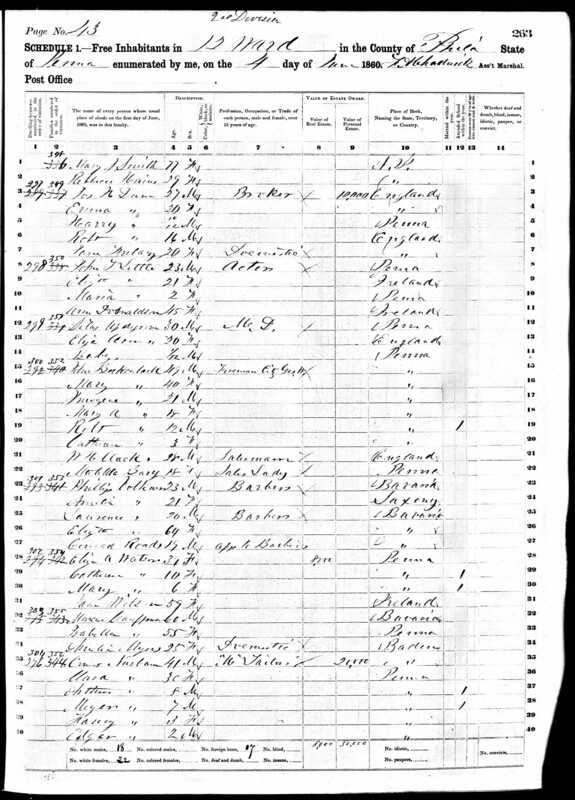 She and her husband Moses Wiler were living at 466 North 4th Street in 1862 with their four children, who ranged in age from Eliza who was twenty to Clara who was twelve. Moses was in the cloak business. So by 1863 the Simons, Nusbaums, Dinkelspiels, and Dreyfusses were all somehow interrelated, often in more than one way. By 1866, Moses Pollock and Mathilde (Dreyfuss Nusbaum) Pollock had also moved to Philadelphia from Harrisburg. In 1868, Flora Nusbaum, the daughter of Mathilde Dreyfuss and Maxwell Nusbaum and step-daughter of Moses Pollock, married Samuel Simon. 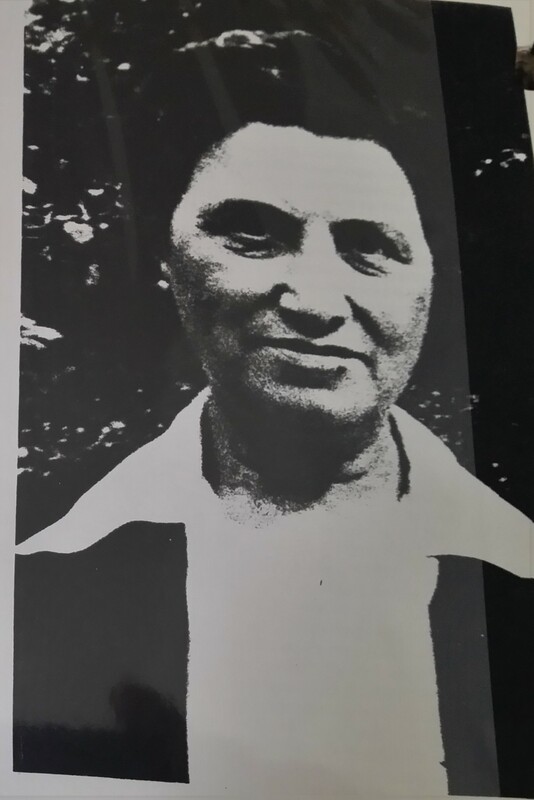 I have mentioned this before because Flora Nusbaum is my double first cousin four times removed since both of her parents were siblings of one of my three times great-grandparents, Flora’s father being John Nusbaum’s brother, her mother being Jeanette Dreyfuss Nusbaum’s sister. Now Flora was marrying her first cousin Paulina’s brother-in-law Samuel Simon, who was also her cousin Eliza’s brother-in law. Groan…. Maybe this chart will help. 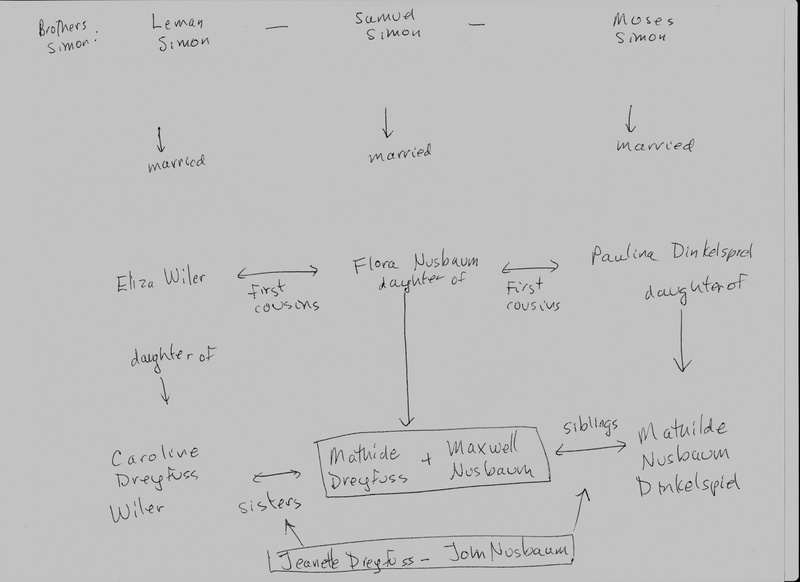 So all three Simon brothers were now married to someone in the clan: Samuel to Flora Nusbaum, Leman to Eliza Wiler, and Moses to Paulina Dinkenspiel. 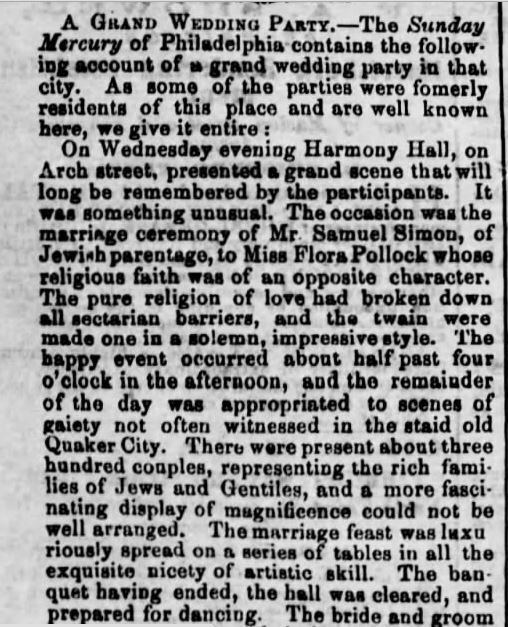 The wedding of Samuel Simon to Flora Nusbaum (Pollock) seems to have been a celebration worthy of all that interconnectedness. 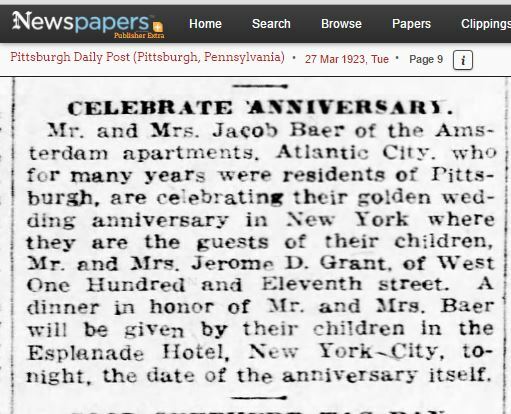 Here is an article from the Harrisburg Telegraph of October 20, 1868, republishing an article from the Philadelphia Sunday Mercury that described their Philadelphia wedding. 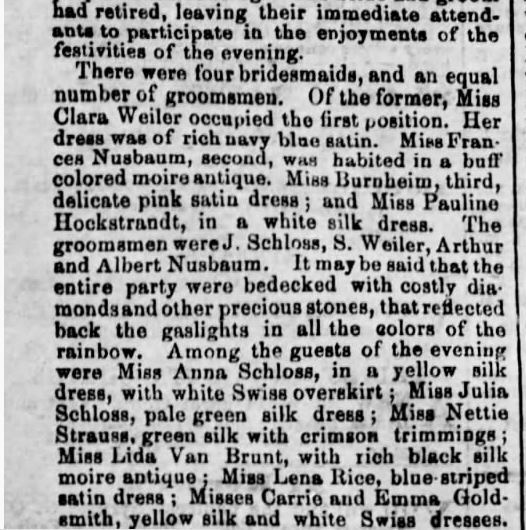 It’s really worth reading to get the full flavor of both the wedding and “social media” in the 1860s. The strangest part of this article is not the detailed description of the lavish, extravagant wedding celebration, but the reporter’s mistaken assertion that Flora was not Jewish. Certainly her parents were both Jewish, and even her stepfather Moses Pollock was Jewish. The reporter’s statement that “the pure religion of love had broken down all sectarian barriers” seems a bit strange for a wedding announcement, even if it had been an interfaith wedding. But why would the reporter have thought Flora wasn’t Jewish? 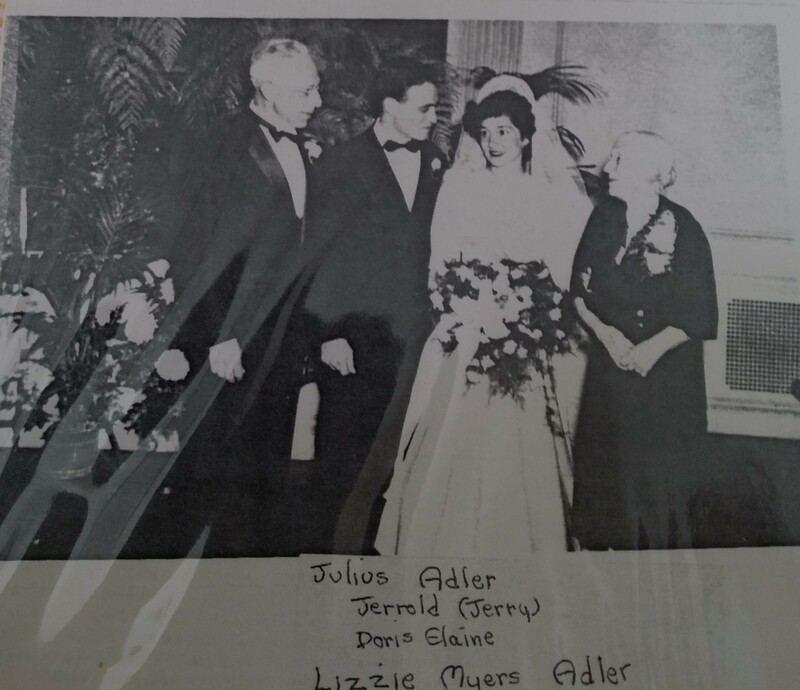 The overlapping branches of the family were well represented in the bridal party: Clara Wiler and Simon Wiler, the children of Moses and Caroline (Dreyfuss) Wiler; Frances Nusbaum, the daughter of John and Jeanette (Dreyfuss) Nusbaum; Arthur Nusbaum, son of Ernst and Clara Nusbaum; and Albert Nusbaum, son of Maxwell and Mathilde (Dreyfuss) Nusbaum and brother of the bride. 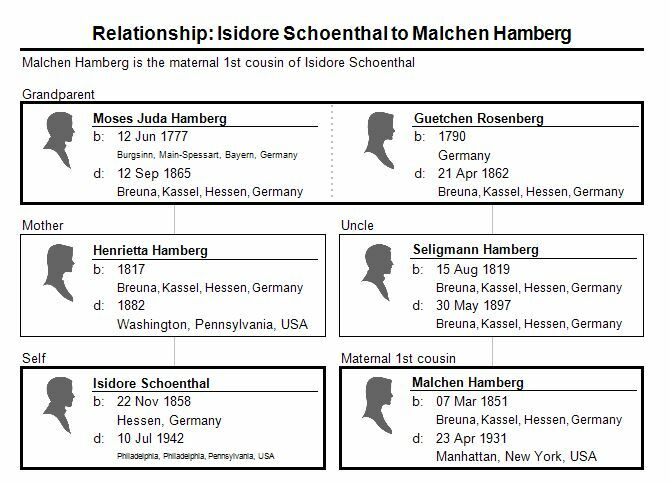 I do not know who the Schloss family is or the Goldsmiths, at least not yet, but I fear more double twists yet to be uncovered. So the extended family was doing quite well, and there were lots of new families being formed and babies born, but unfortunately there also was one big loss in the 1860s. Leopold Nusbaum, who was still living in Harrisburg in the 1860s, died on December 24, 1866. He was buried at Mt. Sinai Cemetery in Philadelphia. 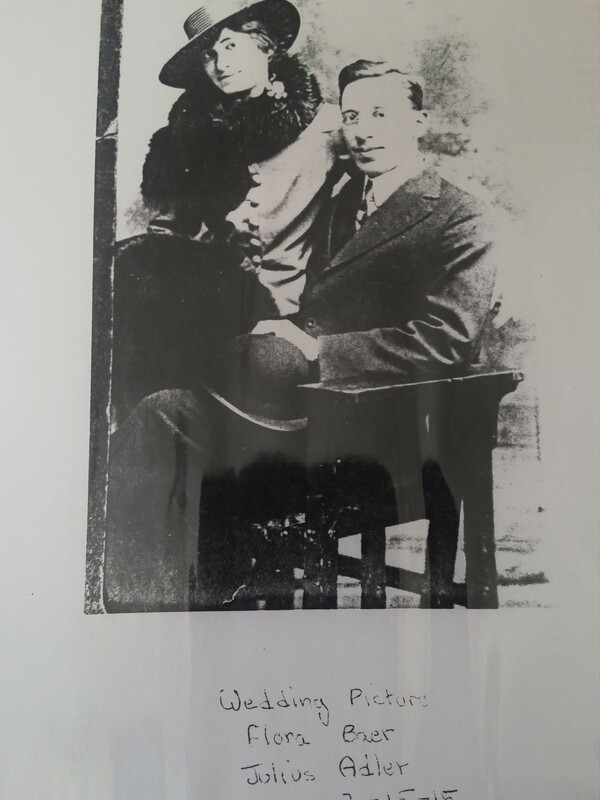 His widow Rosa and sixteen year old daughter Francis moved shortly thereafter to Philadelphia, where they moved in with John and Jeanette Nusbaum, whose household had been reduced by two when Julius moved to Peoria and Frances married. Below is a photo I found while searching for old images of Harrisburg. I was so excited when I saw the name on the store at the far upper right—Leo Nusbaum! Although this photo was dated 1889, Leopold Nusbaum’s name was still on the store even though he had died almost 25 years earlier. 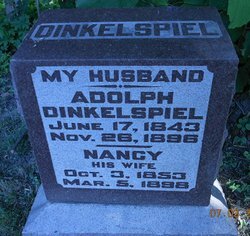 The only Nusbaum family members left in Harrisburg by the end of the 1860s were Mathilde (Nusbaum) Dinkenspiel, her husband Isaac, and their daughter Sophia. 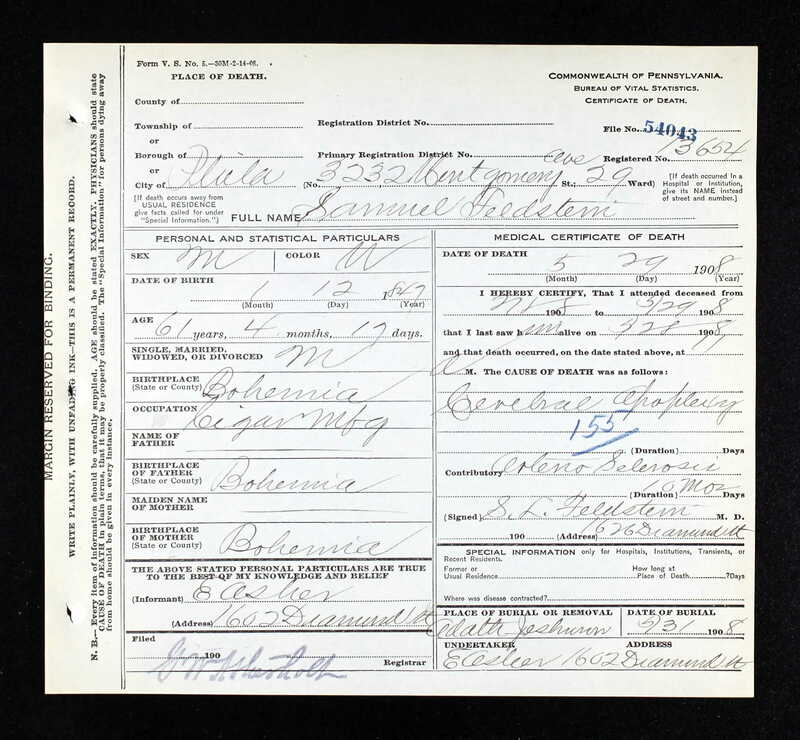 Their daughter Paulina (Dinkenspiel) Simon was living in Baltimore, and their son Adolph was in Peoria. Their youngest child Sophia married Herman Marks, a Prussian born clothing merchant, in 1869, and they settled in Harrisburg as well. Perhaps they were the ones to keep Mathilde’s brother’s name on the store. 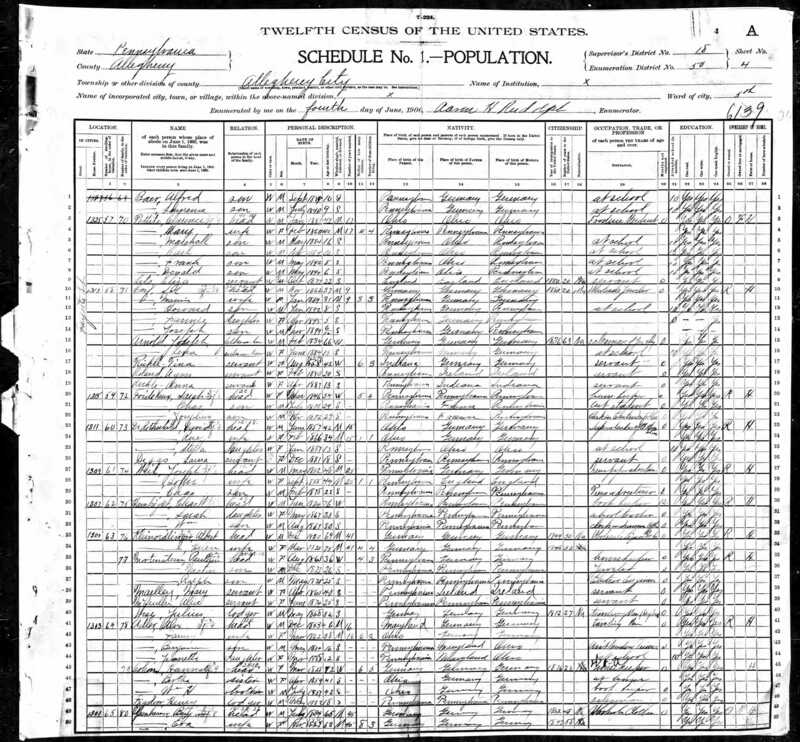 Thus, by the end of the 1860s, most of the extended family was living in Philadelphia, with a small number living in Peoria, a few in Harrisburg, and a few in Baltimore. $600 in 1860 would be worth about $17,000 today, and $20,000 in 1860 would be worth about $571,000 today. Not too shabby for someone who had come to America around 1840. 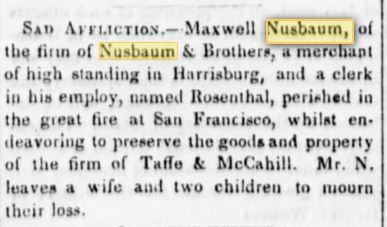 As I wrote in my last post, by 1852 or before, five of the eight children of Amson and Voegele Nusbaum had settled in Pennsylvania. Two of the siblings had settled in Harrisburg, one in Lewistown, one in Blythe, and one in Philadelphia. 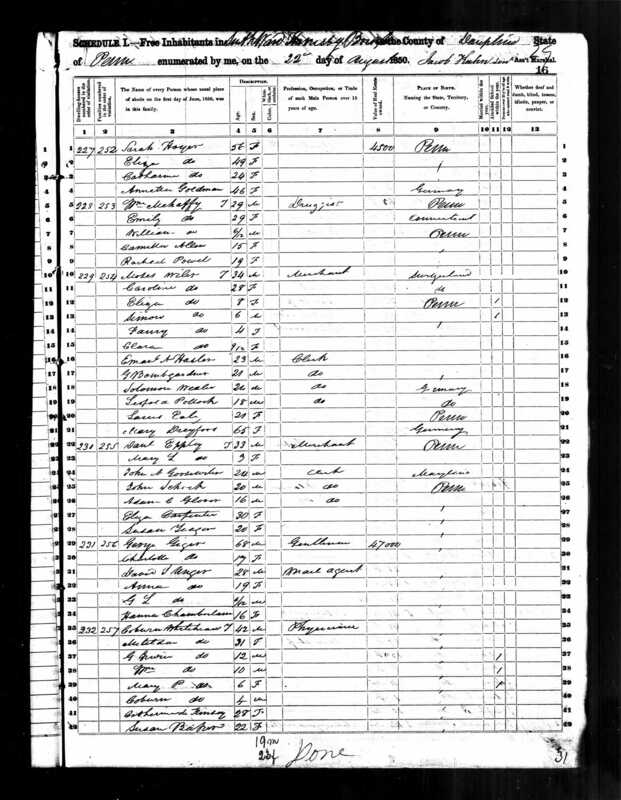 According to the 1850 census, John Nusbaum was a merchant in Harrisburg, and his brother-in-law Isaac Dinkelspiel was a peddler there, married to John’s sister Mathilde. 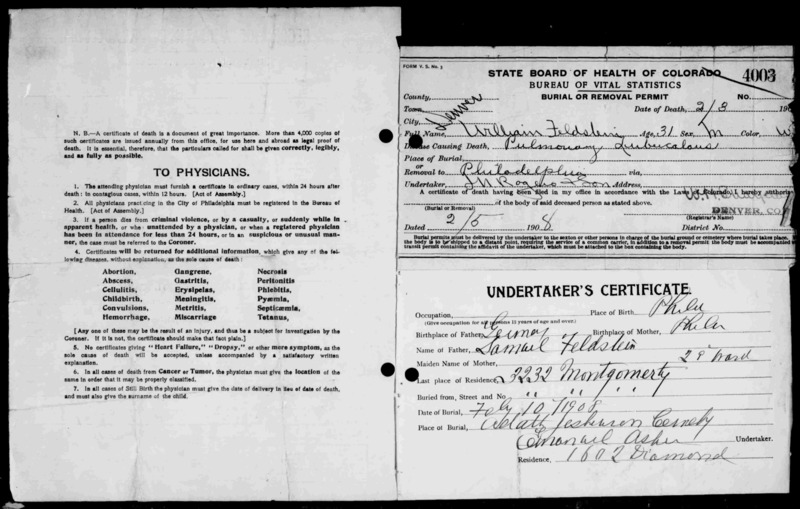 Leopold Nusbaum was a butcher in Blythe, Maxwell was a merchant in Lewistown, and Ernst was a merchant in Philadelphia. 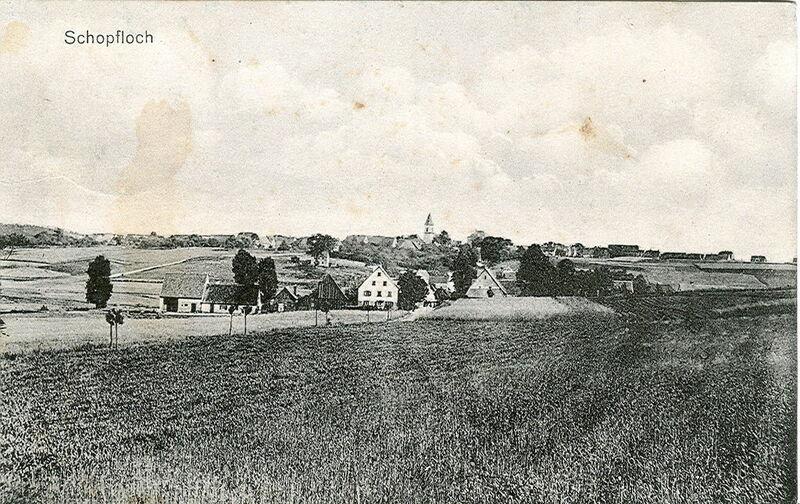 It is not surprising to me that Ernst would have settled in Philadelphia, which, as I have written about in the context of my Cohen ancestors, had a fairly large German Jewish community by the mid 1800s. 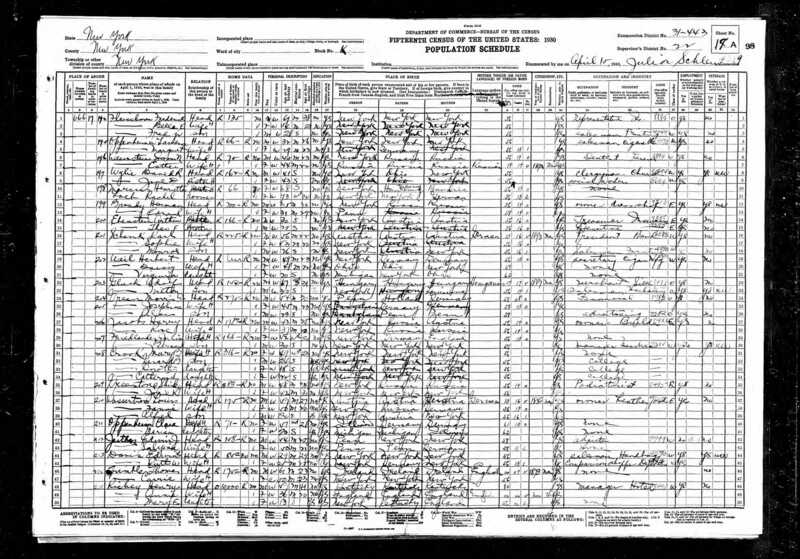 But why were John Nusbaum and Isaac Dinkelspiel and their families in Harrisburg? 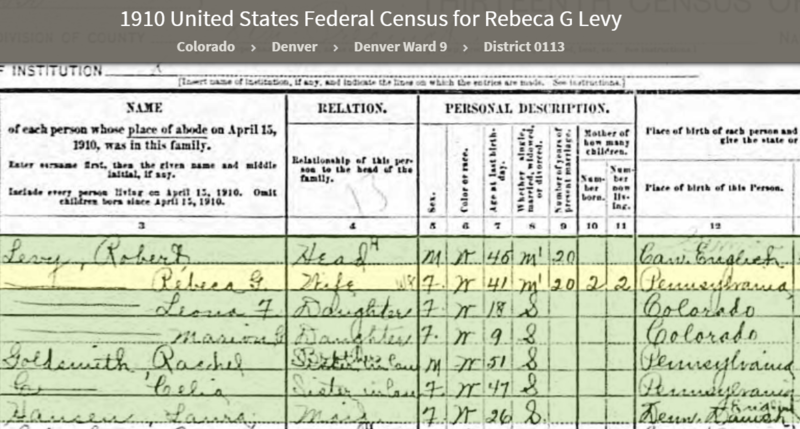 Even more surprising, what were Leopold and Maxwell doing in relatively small towns like Lewistown and Blythe? 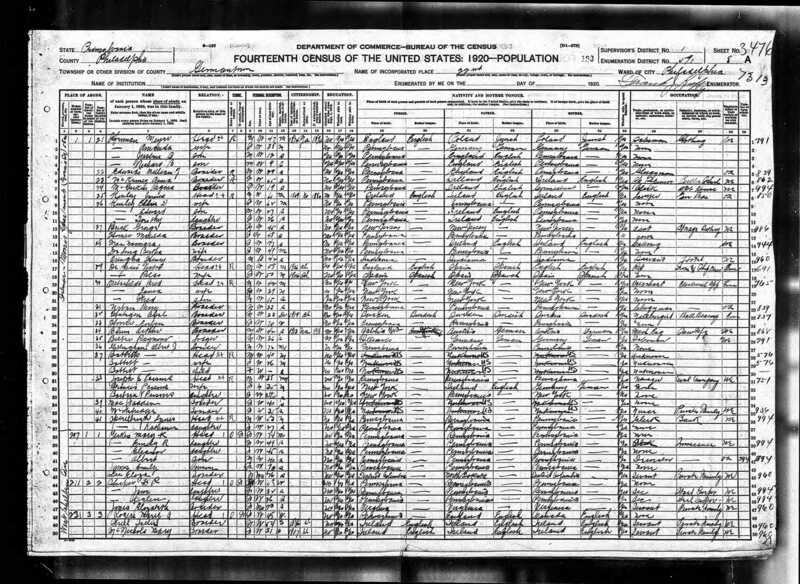 What would have taken these new German Jewish immigrants away from the big cities and to smaller towns and cities in Pennsylvania? The choice of Harrisburg is not really that surprising. 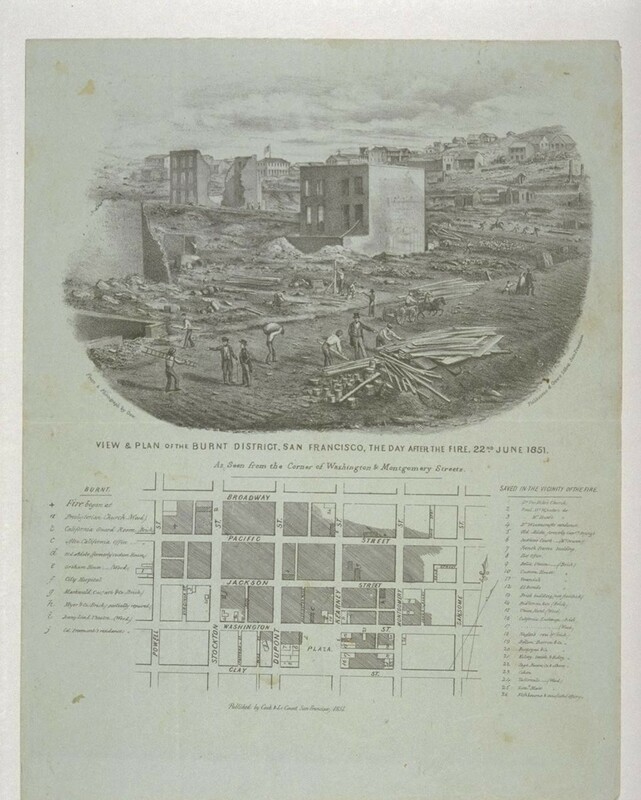 By the time John Nusbaum arrived in the US, perhaps as early as 1840 or even before but certainly by 1850, Harrisburg had been the Pennsylvania state capital for many years already, i.e., since 1812. It had been settled in the early 18th century and because of its location on the Susquehanna River where there was an opening between the mountains, it had developed into an important trading post for trade and expansion to the west. By the 1830s the railroad and the Pennsylvania Canal passed through Harrisburg, further increasing its economic importance for westward expansion. 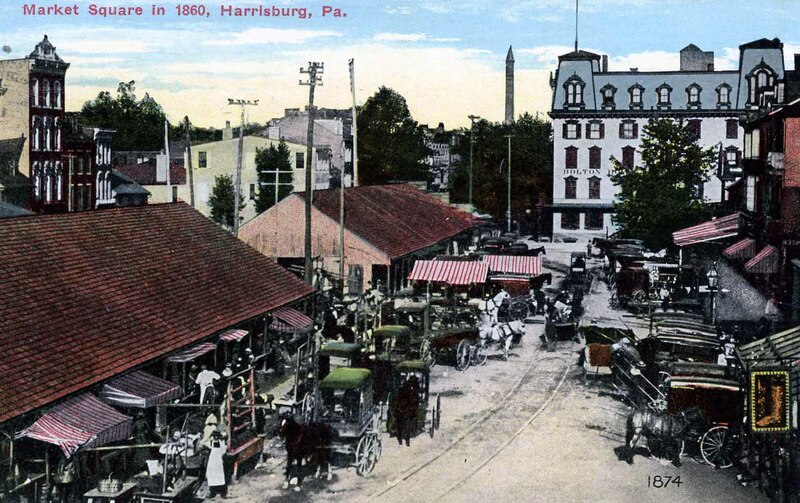 By 1840 the population of Harrisburg was almost six thousand people. By comparison, the population of Philadelphia in 1840 was over 93,000 people. Jewish immigrants began to arrive in Harrisburg in the 1840s, primarily from Germany and England. 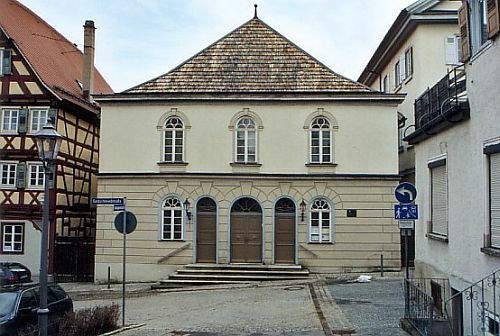 The first synagogue, Ohev Sholom, was begun in 1853, first as an Orthodox congregation, and then in 1867 it became a Reform congregation. The Jewish population, however, was not very large. There were sixteen members of the congregation in 1853, and even as late as 1900 there were only 35 members. 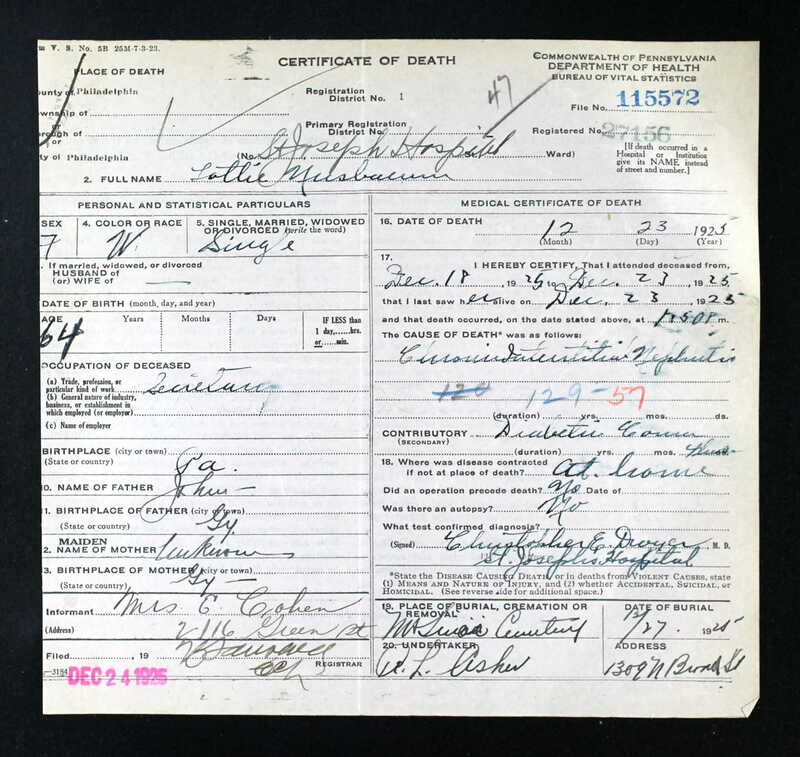 So how would my three-times great-grandfather John Nusbaum have ended up here? 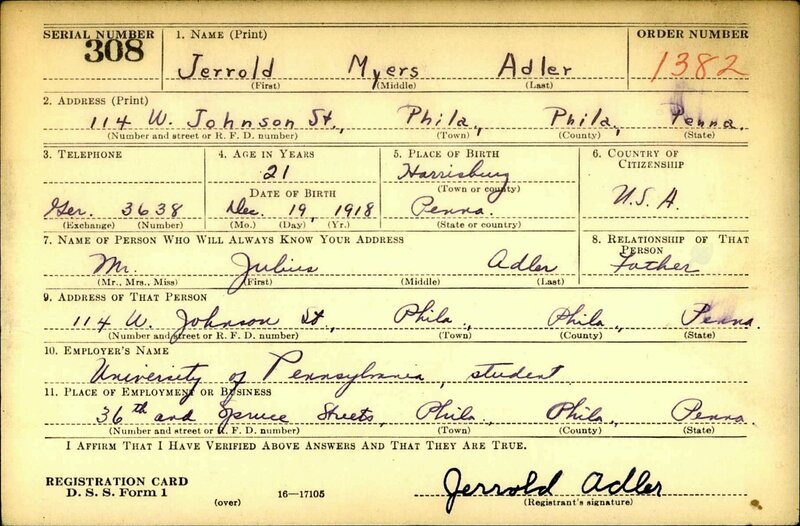 I do not know for sure, but I can speculate that like many German Jewish immigrants, he arrived in Harrisburg as a peddler and, once finding a strong and stable economic base there, eventually opened his own store. Harrisburg was obviously an important location for trade not only for its residents but also for those who stopped there as they moved westward in the United States. It was likely an ideal location for a merchant. 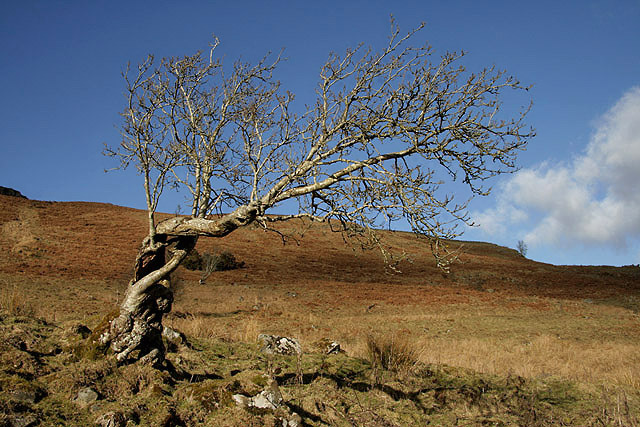 Unlike his three-times great-granddaughter (and her immediate relatives), he must have been a very able entrepreneur. In Nashville, 23 percent of the adult male Jews in 1860 peddled, as did 25 percent of those in Boston between 1845 and 1861. 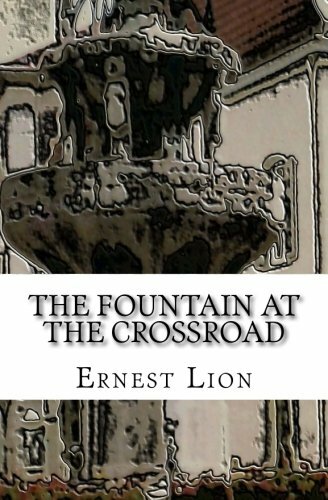 In Easton, Pennsylvania, a town which occupied the strategic meeting point of the Delaware and Lehigh Rivers, 46 percent peddled in 1840, but just five years later, the number jumped to 70 percent. By 1850 the number had dropped to 55 percent, still a significant figure for any one occupation among a relatively small number of people. Of the 125 Jewish residents in Iowa in the 1850s, 100 peddled around the state, as did two-thirds of all the Jews in Syracuse, New York in that same decade before the Civil War. See also Rudolf Glanz, “Notes on Early Jewish Peddling in America,” Jewish Social Studies ( Indiana University Press, Vol. 7, No. 2, April, 1945) located here. In a different article, “German Immigrant Period in the United States,” (hereinafter “German Immigrant”) located here in the Jewish Women’s Archive, Hasia Diner explained why peddling was so widespread among German Jewish immigrants. Americans in the hinterlands had little access to finished goods of all sorts, since few retail establishments existed outside the large cities. Jewish men overwhelmingly came to these remote areas as peddlers, an occupation that required little capital for start-up and that fit the life of the single man. 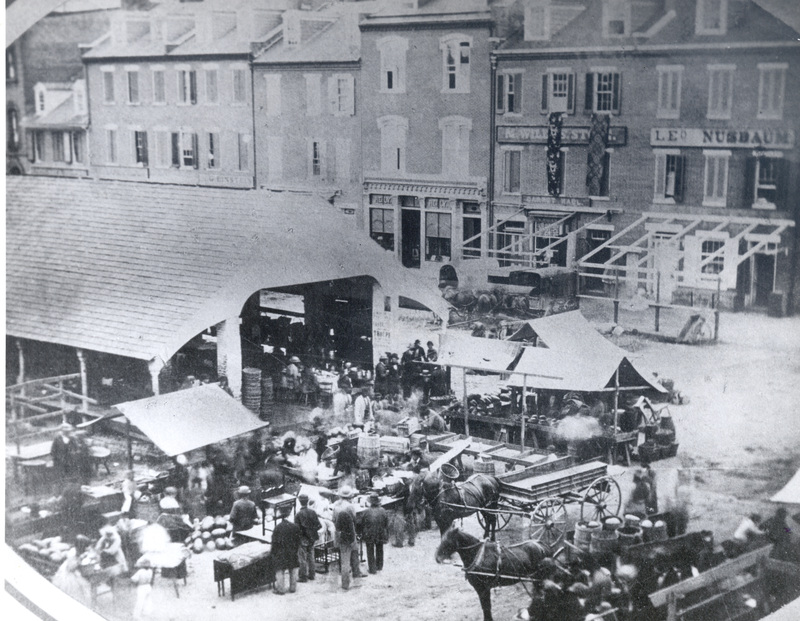 In the large regional cities, Jewish immigrant men would load themselves up with a pack of goods, weighing sometimes as much as one hundred pounds, and then embark on a journey by foot, or eventually, if a peddler succeeded, by horse and wagon. 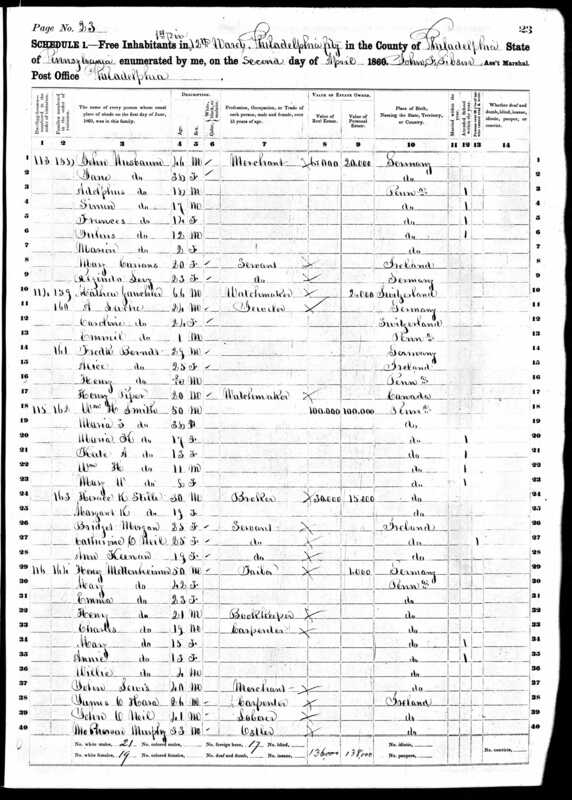 In “German Immigrant,” Diner opined that because many of these German Jewish immigrants came as single men, they were not tied down to families in a particular location when they first arrived and could thus take on the itinerant life of the peddler. In her “Peddling” article, Diner further explained the popularity of peddling, pointing out that many of these German Jewish men came from families in Germany where their fathers had been peddlers. That was certainly true for John Nusbaum and his brothers; their father Amson had been a peddler. This was an occupation with which they were familiar. 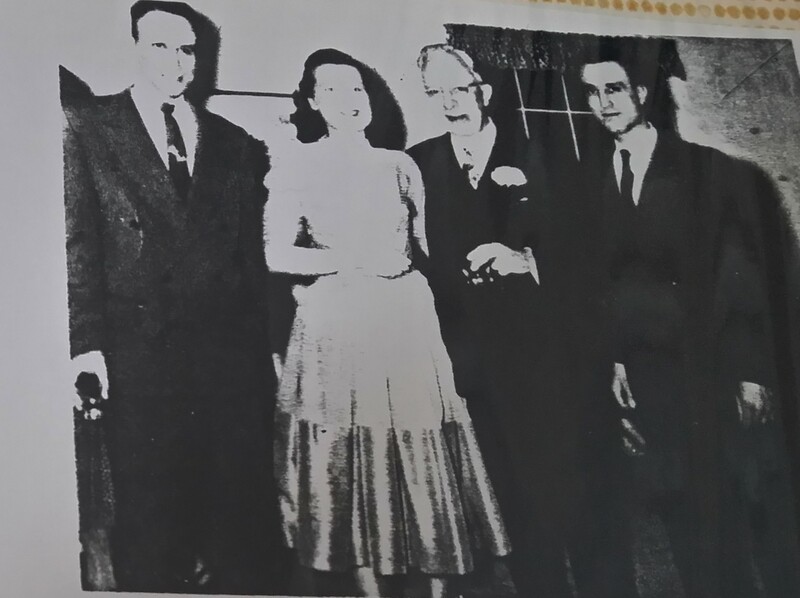 Diner also stated that the Jewish German immigrants had networks of families and friends who could extend credit and help them get started on a peddling business. The peddlers operated on a weekly cycle. They left their base on Sunday or Monday, depending on how far they had to go. They would, if necessary, take the railroad or canal barges to get to their territories. They peddled all week and on Friday headed back to the town from which they had gotten their goods. Here on the Jewish Sabbath and, depending on geography, on Sundays as well, they rested, experiencing fellowship with the other immigrant Jewish peddlers who also operated out of this town. The peddlers engaged with the settled Jewish families, some of whom either operated boarding houses for peddlers or merely extended home hospitality to the men during their brief respites off the road. On the weekends the peddlers could partake of Sabbath religious services and consume some of the good food associated with Jewish holy time, food prepared in the distinctive manners of the various central European regions. Saturday night, after sundown, when the restrictions of the Sabbath lifted, the peddlers came to the shopkeepers and or other creditors to whom they owed money, paid up from the goods they had sold that week, and then filled up their bags, ready for another week on the road. The peddlers did not sell food or fuel. Rather they sold a jumble of goods that might be considered quasi-luxuries. In their bags they carried needles, threads, lace, ribbons, mirrors, pictures and picture frames, watches, jewelry, eye glasses, linens, bedding, and other sundry goods, sometimes called “Yankee notions.” They carried some clothing and cloth, as well as patterns for women to sew their own clothes, and other items to be worn. At times they carried samples of clothes and shoes, measured their customers, and then on return visits brought the finished products with them. When the peddlers graduated from selling from packs on their backs to selling from horse and wagon, they offered more in the way of heavy items, such as stoves and sewing machines. As Diner points out, often these peddlers were the first Jews in a particular town or village. Once a peddler had saved enough money to start a permanent store and become a merchant, they would often pick one of these towns where they had had success as peddlers, gotten to know the residents, and established a rapport and a reputation. Both Diner and Glanz discuss this evolution from peddler to merchant. According to Diner in “Peddling,” most peddlers did not peddle for long periods, but were able to become storeowners, marry, and start families within a reasonably short period of time. Most became at least moderately successful, and some became the owners of some of the biggest department stores in the US, such as Gimbel’s and Macy’s. My hypothesis is that John Nusbaum also started out as a peddler. 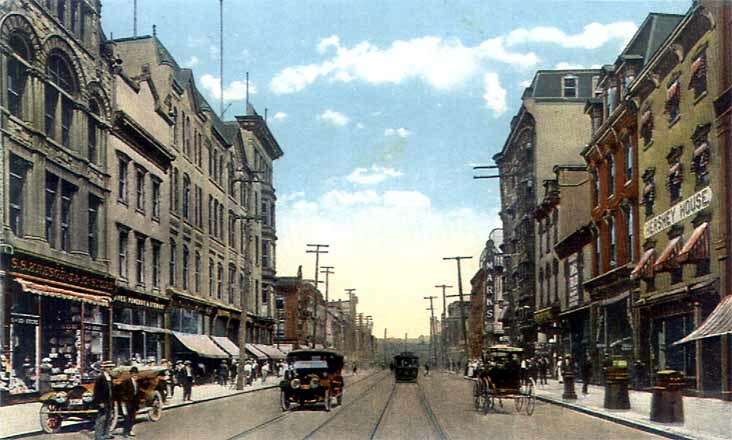 He must have started from Philadelphia or perhaps New York as a single man and peddled goods through Pennsylvania until he accumulated enough capital and was able to settle in Harrisburg, a prime location for a merchant for the reasons stated above. Perhaps it was only once he had done so that he married Jeanette and started a family in the 1840s. 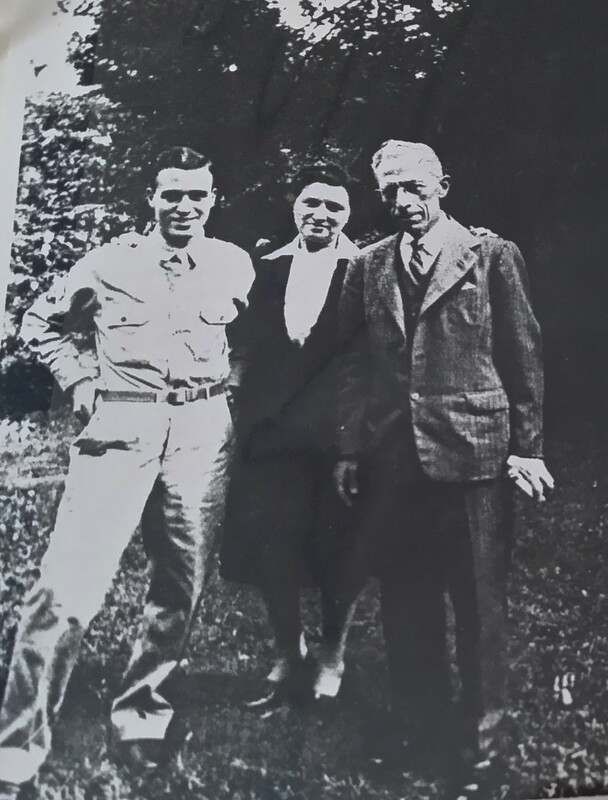 When his brother-in-law Isaac Dinkelspiel arrived with his wife Mathilde Nusbaum Dinkelspiel sometime later, it would have made sense for them to settle in Harrisburg. 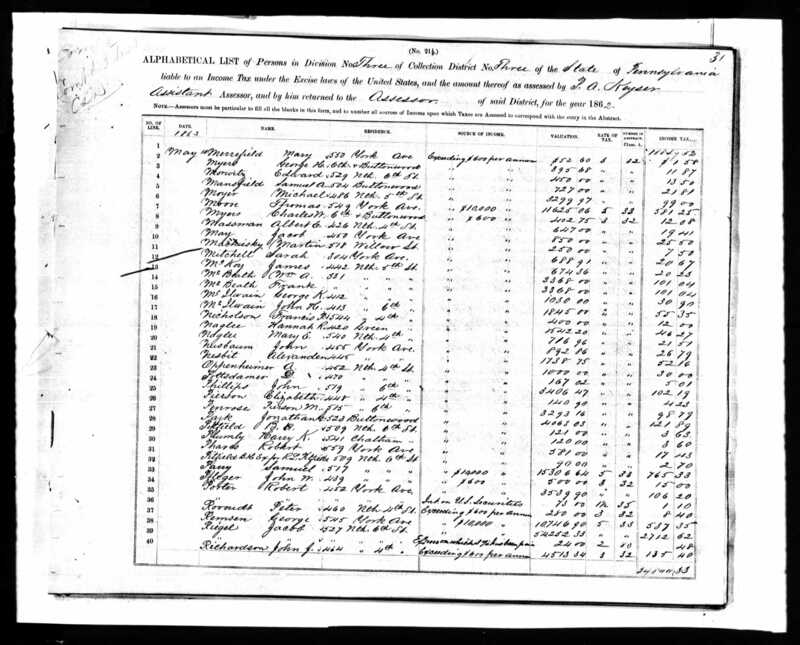 Since Isaac also started out as a peddler, as seen on the 1850 census, as a married peddler with children, it is not surprising that they would have moved to a place where Mathilde would have had family nearby while her husband Isaac was on the road. In addition, it is very likely that John was supplying Isaac with the products he was peddling. According to Diner, it was Jewish merchants who supplied the peddlers with the goods that they then carried out to the less settled regions to sell to those who lived there. Jewish peddlers needed Jewish merchants for their inventory, and Jewish merchants benefited from the increased market they could reach through the peddlers. 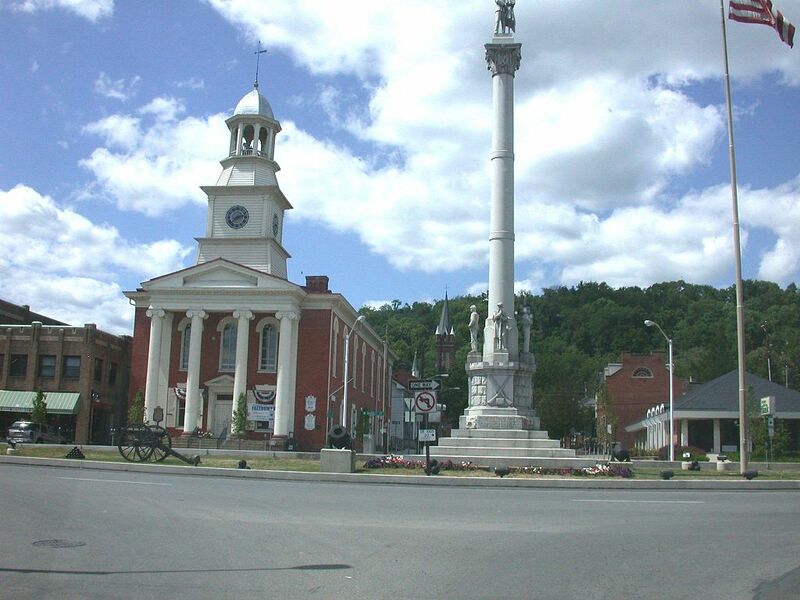 Maxwell, John’s youngest brother, was also a merchant by 1850, but he was in Lewistown, sixty miles from Harrisburg and about 160 miles from Philadelphia. What was he doing there? Unlike Harrisburg, it was not the state capital, and unlike Philadelphia, it was not a major seaport city. But it was by 1850 itself an important trading center based on its location near the Pennsylvania Canal and the railroads. Mifflin County, where Lewistown is located, had a population of close to 15,000 people in 1850 so it was not an insignificant location. 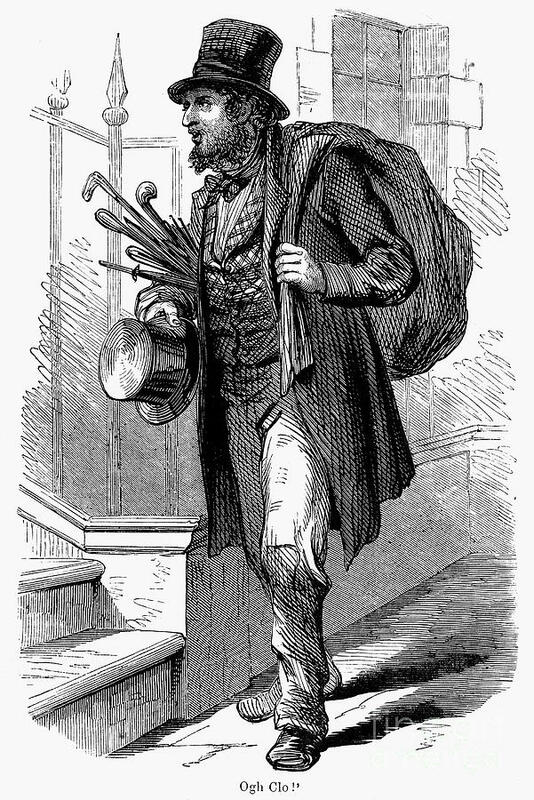 I assume that Maxwell, arriving after his brother John, had also started as a peddler, selling the wares he obtained from his brother, and traveling around the state, until he was able to save enough money and establish a store in his own territory, close enough to his brothers, but not so close as to compete for business. A map of Lewistown in 1870 shows that Nathan Frank had a store at Brown and Market Streets, listed in a business directory of the time as Franks — Dry Goods, Carpets, Clothing, Furnishings, Goods, Etc.” Spruce Street was at that time listed as Nusbaum Street and in April, 1880 M. Nusbaum — Clothing & Gents Furnishings was advertised. By 1907 however Nusbaum & Co. was no longer listed in the directory. The biggest mystery to me is why Leopold Nusbaum ended up in Blythe as a butcher. Blythe is sixty miles from Harrisburg and a hundred miles from Philadelphia. 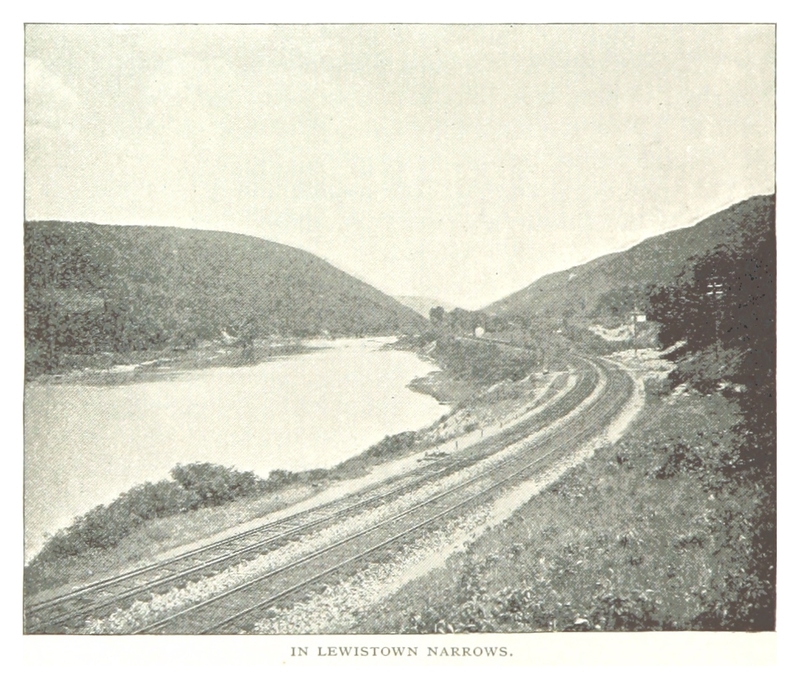 Like Lewistown, it was also located near railroads and the canals. I cannot find anything about its population in 1850, but even today its population is under a thousand. Schuykill County, where Blythe is located, however, had an overall population of over sixty thousand in 1850, which was a doubling of its 1840 population. Something must have been happening there, but I’ve not yet been able to figure out why its population exploded in that ten year period. Perhaps that explains why Leopold was living there with his wife Rosa and two young sons in 1850. But why was he a butcher? Certainly he could not have been a kosher butcher; even today the Jewish population of Blythe is 0%. At any rate, by 1860, as we will see, Leopold and his family had left Blythe and moved to Harrisburg, where Leopold also followed in his brother’s footsteps and became a merchant. Thus, the Nusbaum story is not unlike the story of many of those German Jewish immigrants who came to the US, started off as peddlers, and then became merchants, owning stores all over the United States. It must have taken a lot of hard work and a courageous spirit to move to this new country, carrying a heavy pack hundreds of miles through undeveloped territory, dealing with strangers who spoke a strange language, on your own and alone for most of the week. It must have taken much determination and persistence to do this week after week, maybe for a few years or more, until you had made enough money to find one town to settle in and establish a store. And then it must have been a hard life, living as perhaps the only Jewish family in that town far away from other family members and other Jews. 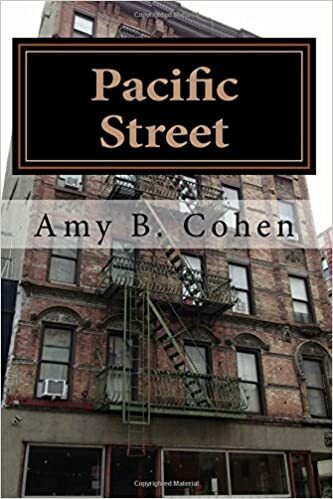 In my posts to follow, I will trace the lives of my Nusbaum peddler and merchant relatives and how they progressed in America.